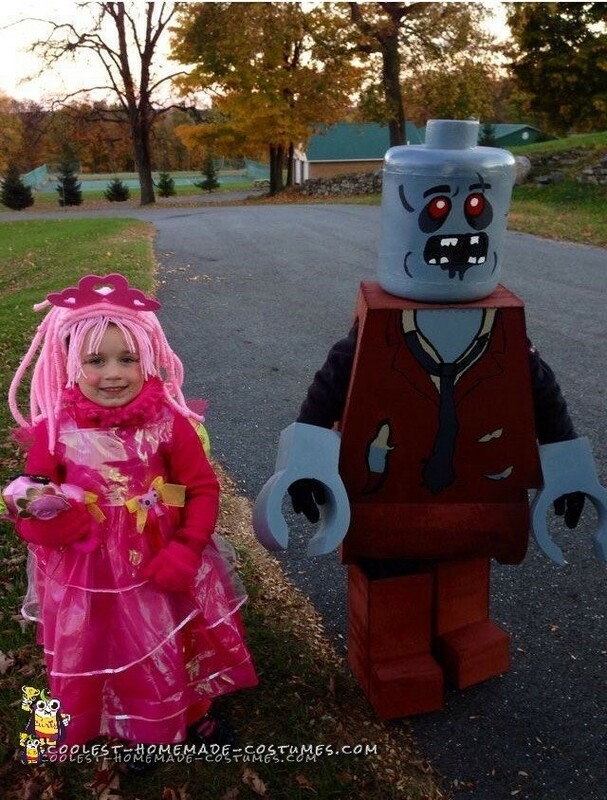 Here are two costumes we made: a Monster Fighter Zombie minifigure costume for our son and LaLaLoopsy costume for our daughter. My son is such a huge Lego fan! When he was 5 his favorite set was the Monster Fighters, which had all the original monsters in the pack, such as the Dracula, the Wolfman and Frankenstein, you get the idea. When Halloween was near I kept asking G what he wanted to be, he would say Darth Vader, or a Storm Trooper. We went to the costume store and a few local retailers and the costumes seemed very poorly made and quite expensive for a glorified garbage bag (clearly my opinion). That evening when we got home I grabbed the mail from the mailbox and saw we had a Lego club magazine. I called to G he received mail, he always gets so excited when something is addressed to him. Immediately he was flipping through the pages oohing over the new released sets that he just had to have. There was a scene on one of the pages that was really cool with his favorite zombie. G turned to me and said I want to be a “monster Minifigure! !” That night my husband and I discussed what we would need, and of course I was complaining I didn’t want to spend too much on ” just a costume he will only wear once” lol. My husband built this minifigure costume on his own, he used cardboard tubes for concrete, regular cardboard, foam, suspenders for fastening the top to my son, rain boots covered in cardboard and screen. Also, it’s my husband’s steady hand at drawing the costumes details. The minifigure costume came out perfect, and it showed. My son won the local YMCA costume contest for Most Original, in which he received a book and recognition for his age group. Later that evening he won another costume contest which consisted of a restaurant voucher. He was excited to win, and loved being a Lego minifigure come to life. In this picture, my daughter as a Lalaloopsy Jewel Sparkle. We created the wig from yarn and glue, made her dress, and did her make up. She was super cute and enjoyed Halloween and dressing as one of her favorite dolls. She won the YMCA for cutest Girl category. It made for a wonderful and Happy Halloween.